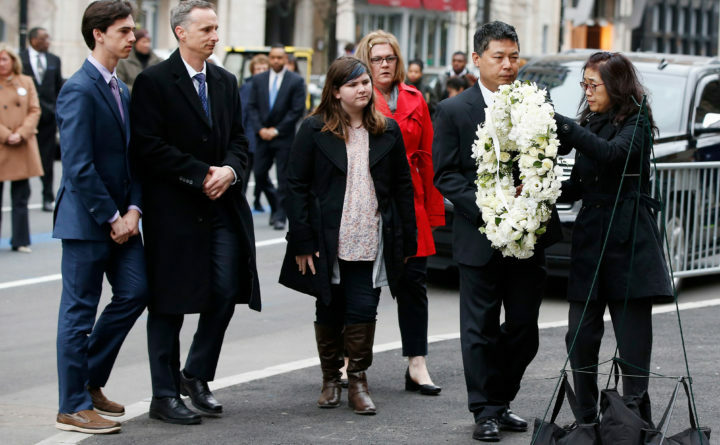 The father of Lingzi Lu, Jun Lu, second from right, and her aunt Helen Zhao, right, place a wreath as the family of Martin Richard, from left, Henry, Bill, Jane and Denise look on during a ceremony at the site where Martin Richard and Lingzi Lu were killed in the second explosion at the 2013 Boston Marathon, Sunday, April 15, 2018, in Boston. Jane and Henry Richard, siblings of the youngest victim, Martin Richard, and members of the family’s foundation, also spoke. Victim Lu Lingzi’s uncle, Sherman Yee, was present at the ceremony and private gathering. He said, “The family has been overwhelmed by love and support from all over the world. '” He called Lingzi an “extraordinary girl” who represented the youth that come to the U.S. from China to study. The bombs also killed 29-year-old Krystle Campbell of Arlington. Massachusetts Institute of Technology police Officer Sean Collier was killed in the line of duty during a confrontation with bomber Tamerlan Tzarneav. Arreen Andrew of Boston said she was in the crowd across the stand when the first bomb went off in 2013. For some, such an anniversary is about planting the seeds of change. Forty-three-year-old Heather Abbott of Newport, Rhode Island, hosted a fundraiser for her foundation that supports amputees. Abbott was outside Forum, a restaurant by the finish line, when the impact of the second bomb blew her through the entrance of the building. Former New England Patriots lineman Matt Chatham and his wife, Erin, were in the restaurant and carried Abbott to safety. Abbott says the foundation has given out 19 prosthetic devices out so far. “They can cost from $15,000 to as much as $100,000,” she said.